Astros County: Your Neighborhood Astros Blog & Grill: Does this look low to you? Does this look low to you? Got another image in the inbox from Citizen Chris, this one of the called third strike with the bases loaded versus Pence in the 8th inning of last night's game. Here it is with the area where the ball was all shaded in with bright white - I don't know, it was a fairly close pitch. But he hadn't been calling low ones like that all game. 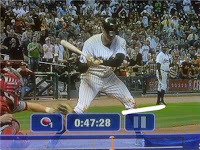 It was clearly below Hunter's knees - and Hunter already has a disadvantage by being lanky and having a big strike zone between his knees and waist. I ran that one again with my DVR because although it was some what close, it was definitely a ball. No one's perfect, but that all but killed any momentum we hadd. Pence has definitely been jobbed on some calls this year.